You’ve just been served divorce papers. Your dog bit a neighbor and now a lawsuit is looming. A car accident has left you disabled, you believe the person responsible should foot the medical bills. Legal situations can pop up at anytime in your life. Do you know how to choose the right lawyer for the job? With all the TV commercials and radio ads spewing legal advice your way it can be an overwhelming task. 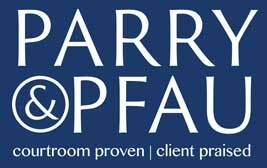 The first firm that comes to mind should be Parry & Pfau (we do offer free consultations), but in the off chance we’re not the right fit for you, here’s five questions you should be asking a prospective lawyer. Question 1: Are you experienced/well connected? Don’t be afraid to ask a lawyer what experience or areas of expertise they have. If he or she don’t have the skill set to accommodate your needs, they will most definitely be able to recommend someone who can. Things to consider when it comes to experience: How long have they been practicing? How many cases have they been involved with? Aside from a law degree do they have any other special training or certifications? Finding someone who can completely have your back from day one is key. And one way great lawyers do that is through their network of connections. Be sure to ask a prospective legal hire about their professional relationships and how they “outsource” or gather any knowledge/skills they can’t personally provide. Question 2: Am I a typical client of yours? This is one of those questions many people don’t think to ask. You wouldn’t have open-heart surgery performed by a dentist right? Just as you wouldn’t have an attorney who only specializes in family law represent you in a case over trademark infringement. If an attorney is used to working with corporations, you wouldn’t hire him to represent your college-aged son or daughter. Question 3: What are my options? Sometimes you may not even need a lawyer for your particular issue, or the attorney may not think you have a strong case. Going to court never comes with any guarantees, other than the fact that it will take time and money to get any sort of result—maybe not even the right result. A good attorney will be able to inform you of alternative ways to solve your legal problem, which could include arbitration or other out-of-court arrangements (these can also be less expensive and time-consuming options). Question 4: What is your approach or philosophy when representing a case? If, for example, you are looking to settle your divorce proceedings amicably, you won’t really need a cut-throat style lawyer. On the flip side, if you’re looking for a more aggressive one, be sure the lawyer in question is the right personality/style for you and your problem. In many cases, you will be interacting and speaking with your attorney frequently. Question 5: How does your billing process work? Lawyers fees and the billing process differ everywhere so it’s a good idea to ask this question up front (a lawyer has an ethical duty to tell you up front, but not all do). Not only will it prevent any headaches or surprises down the road, you’ll have an idea what sort of dollar amount to expect and whether or not you can afford the attorney. No matter how you choose the right lawyer for your particular set of circumstances, it is imperative that you ask these core questions. Got a legal issue of your own? Contact us for a free consultation and see if we’re the law firm for you. Will I Get a Higher Settlement if I Hire a Lawyer? Our clients and potential clients are smart. They realize that in some circumstances, it doesn't make sense to hire an attorney. They have already talked to the insurance adjuster of the at-fault driver, and the adjuster has been really friendly and may even have already offered some settlement amount. If they're already offering to pay, why would you hire an attorney who is just going to take a portion of the eventual settlement? In my experience, the best lawyers are great communicators. This is particularly true for litigators. True, you must have a strong grasp on law and procedure. Without it, your communication efforts won’t get very far off the ground. However, I am talking about the difference between good and GREAT lawyers. Merry Christmas or Happy Holidays? We’ve made it a yearly tradition to send Christmas and Holiday Greetings to our friends, clients, and associates through a fun Video Christmas Card. Tomorrow many of us will sit down to a feast surrounded by loved ones and give thanks for all that we have. Given the recent atrocities in Paris and overseas, remembering what this holiday season is all about seems that much more important. Owning your own business is the dream of many ambitious entrepreneurs. Some small business owners get caught up in the fantasy and unknowingly ignore laws pertaining to their industry. Curious about what probate law is? Want to know what will happen with your assets if you pass away in Nevada without a will or trust? On Wednesday, October 14, 2015, Matthew Pfau will be offering a free legal seminar to answer these and other probate questions you may have. Is It Financially Feasible to Become a Lawyer? Being an advocate in the law—a lawyer—is a time-honored and noble profession preceded by giants like Abraham Lincoln, Francis Bacon, Thomas More, Alexander Hamilton, and Ben Stein. Nowadays, to become a lawyer, most states require (1) graduation from an accredited law school, (2) passage of the state-administered bar exam, and (3) proof of good moral character. But the prerequisites for a license to practice law were not always so uniform or demanding. The Nevada Assembly Judiciary Committee advanced a number of bills on April 10, 2015, the deadline for doing so. Included in those bills wasAB-263, a bi-partisan measure principally drafted and argued by Family Law Attorney Keith Pickard and vetted by more than a dozen leading Nevada family law attorneys.